OA - Indicates Original is Available! 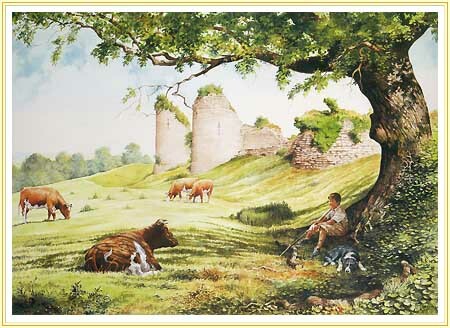 A young boy and his faithful collie companion, watch over several members of the small herd of Guernsey cattle, resting out of the heat of a midsummer's day, beneath the shadow of the old oak tree. He dreams of ancient times when Chartley castle was young and chivalrous knights rescued fair maidens from castle towers. History of the castle from Wikipedia. AND CLICK THE - "ADD TO CART BUTTON"
Take a look at our most recent Newsletter.